Have you ever stopped to consider your work as that of a ‘communal doctor’ whose efforts are designed to impact individual quality of life, mental health, and ultimately, overall community health? There is a growth in recent scientific research that reinforces the correlation between how communities are designed and built and the mental health of their residents. Our built cities have become urban ecosystems, biological communities of living things in a given area interacting with each other and the non-living environment. In a healthy ecosystem, each organism or element of the system has its own niche or contribution. There is a natural order of things that interconnect with each other, but many of our urban cities have failed to reach this harmony. 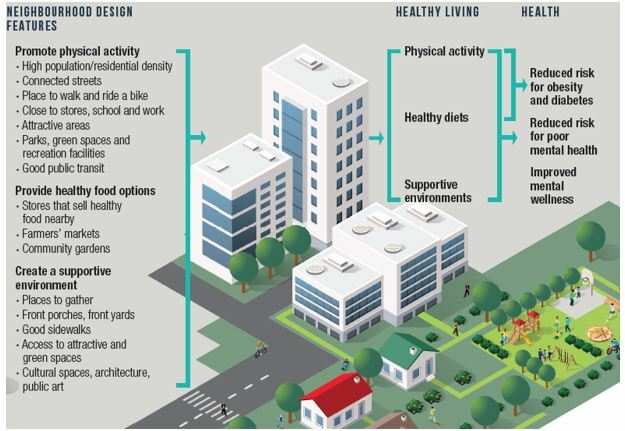 It is becoming very apparent that social cohesion, relationships, and personal investment in the community – often referred to as ‘social capital’ – is an important determinant of overall community health, and therefore should play a bigger role in urban design. Figure 1: The Chief Public Health Officer’s Report on the State of Public Health in Canada 2017. Community development and urban planning fields originated in the early 19th century over concerns of public health problems created by overcrowded slums and dirty industries. But the connection to public health and the built environment shortly thereafter began to diverge; public health focused more on genetics, biology, and behavior with an epidemiological, evidence based approach, while community development was preempted in designing its built environment around the automobile over the socioeconomic-wellbeing of its people. However, there seems to be a renewed interest in rejoining community development and public health to help address mental health, obesity, cardiovascular disease, depression, homelessness, violence, social inequality, affordability, mobility, etc. Two centuries later, technology and innovation dominate everything, including community development. In this new era of city building, people are seeing more tech industries involved and changing the metrics of community design, public health, and increasing inclusivity of its residents in the development process. The tech industry is actively developing an array of digital tools that are trying to make the community development process more transparent and interactive for people. Cities like Santa Monica, California are exploring smartphone technology that employs a Tinder approach, called CitySwipe, to influence community development decisions. Residents can swipe left or right and provide instant feedback on urban design decisions such as street furniture, green infrastructure, parking, proposed developments, murals, bike lanes, etc. The software is fairly basic, but it’s rapidly advancing and working to get the public more involved in the development consultation process without using lengthy mail-out response forms, wordy PDFs, online surveys, or asking people to attend inconvenient public comment hearings. 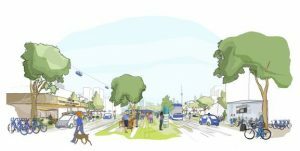 Google’s parent company, Alphabet, will be redeveloping the initial 12-acres Quayside District of Toronto’s waterfront. The project is called the Sidewalk and has an additional 800-acres from the adjacent district for future expansion. Its vision is to create a brand new mixed-use urban district “from the Internet up,” merging the physical with the digital while applying high-tech design concepts at scale. The community design is data-driven and connected, monitored with sensors, and generates big data collections to become the first “programmable public realm.” It is truly an urban district planned and programmed to build new societies and solve public health dilemmas of our age. To engage the public realm, Google offers a mix of traditional uses in flexible spaces with a system of asset monitoring. The company plans to design for ‘climate-positive living’ using smart appliances managed by remote sensors that support a range of commercial, institutional, and residential uses with diverse co-housing possibilities. 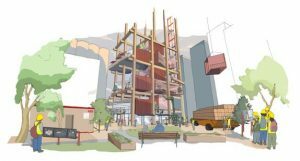 The proposed timber-frame modular construction will use onsite assembly techniques that will allow for quick and easy structural adjustments that could accommodate a temporary change in use or living arrangement, such as a café expanding into a restaurant co-working space; or a parent, sibling, or friend moving in or out of the home. The company proposes to design a district-wide thermal energy grid, including underground garbage, waste, and composting infrastructure, deep-water cooling system, robotic package delivery, sensors for air and noise quality control, as well as sensors to manage wind, sun, and rain that could double the number of daylight hours and outside comfortability around the district. Self-driving and/or car-sharing vehicles are the only automobiles that will be permitted, providing point-to-point convenience without the safety risks and high costs of owning and maintaining private vehicles. (Americans can spend approximately $7,000 or more per year to own, maintain, insure, and drive a car and often choose their car over paying for adequate health insurance or needed medical care.) This feature will also eliminate the need for on and off-street parking requirements that dominate traditional urban design and zoning requirements. Additionally, the pedestrian and bike pathways in the tech-district are designed to melt snow, promoting safe year-round usage with the sole purpose of bolstering renewed street life and active multi-purpose public spaces. Google is not the only tech company that has shown interest in the city building industry. Lyft, a transportation network company based in San Francisco, California has proposed street redesigns for a driverless future (e.g. Wilshire Boulevard in Los Angles); proposing transportation concepts that eliminate traffic lanes while doubling the transportation capacity of the street. Studies have shown that mixed-use neighborhoods, with shops, schools, libraries, workplaces and homes designed around easy walking distance tend to support higher levels of physical activity and have lower rates of obesity. People working in community development fields can utilize new technologies to engage communities and start retrofitting cities to strengthen their social capital and increase community health through urban design that is more responsive to needs of people, rather than cars. One tool used in helping people visualize new developments and changes in their community is the augmented reality technology UrbanPlanAR. It overlays a 3D picture planned development within an actual urban environment in real-time. The technology enables one to hold their mobile device and use its camera to see what the proposed development would look like. The tech industry is challenging how community development and urban planning has been done for decades. To improve quality of life, strengthen economies, and protect the environment, organizations like Future Cities Catapult in London, England are working in city labs to develop and test new technologies and prototype tools to make the planning process fit for the 21st century. Their efforts are designed to spread the innovations to cities and community development departments and practitioners across the world. Such developments excite people working in community development fields who are frustrated with old-school planning and community engagement tactics. Such innovations could both streamline the bureaucracy and make the whole community development process more transparent for community members. Such tech-tools could also help answer complex questions about trade-offs. To aggregate the city’s physical, social, and green infrastructure, the city of Manchester in the UK has created an interactive tool called Greater Manchester Open Data Infrastructure Map using GIS technology. It shows transportation networks, real estate information, brownfields, proposed development sites and more, enabling interested individuals to see how the community is developing and be involved in the design process. Physicians have focused on individual patient needs and health problems for decades, but when so many people start having similar problems, such as anxiety, cardiovascular disease, diabetes, and depression, people must realize that poor health is not entirely caused by lack of personal governance, but may be the result of the built environment in which people live. In a way, people working in community development fields have to learn to become communal doctors powered by high-tech tools to improve urban design and community development programming. Meghan Thoreau is an OSU Extension Educator for Pickaway County (Heart of Ohio EERA). Frumkin, H. 2016. Environmental Health: From Global to Local (Public Health/Environmental Health). 3rd Edition. San Francisco, CA: Jossey-Bass. Centers for Disease Control and Prevention. n.d. Healthy Places: Social Capital. Accessed November 29, 2017. https://www.cdc.gov/healthyplaces/healthtopics/social.htm. Rosen G. A History of Public Health. Baltimore, MD: Johns Hopkins University Press; 1993. Jackson, Richard J. 2003. “The Impact of the Built Environment on Health: An Emerging Field.” American Journal of Public Health 93 (9): 1382-1384. Rider, David. 2017. Google firm wins competition to build high-tech Quayside neighbourhood in Toronto. 10 17. Accessed 12 1, 2017. https://www.thestar.com/news/city_hall/2017/10/17/google-firm-wins-competition-to-build-high-tech-quayside-neighbourhood-in-toronto.html. Harvard T.H. Chan School of Public Health. n.d. Environmental Barriers to Activity: How Our Surroundings Can Help or Hinder Active Lifestyles. Accessed November 29, 2017. https://www.hsph.harvard.edu/obesity-prevention-source/obesity-causes/physical-activity-environment/.